Provide comfort for the family of Naomi Holloman with a meaningful gesture of sympathy. 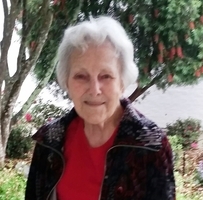 Naomi Riling Holloman, 100, a resident of Lake Charles passed from this life on March 29, 2019 surrounded by her family in the comfort of her own home. She was a native of Lake Charles and lived there all of her life. She was a graduate of Saint Charles Academy in 1936 and was a faithful member of Our Lady Queen of Heaven Catholic Church. She was a member of the Adoration Group since 1991. Naomi was a junior Catholic daughter at 16 years old and at 17, became a member of the Catholic Daughters and the Alter Society and continued until the time of her death. Mrs. Holloman served for 20 years with the annual Retreat for the aged. She was a member of the Saint Monica study club which began in 1940 with some graduates of St. Charles Academy and stayed together until almost all died. She was preceded in death by her parents, George and Mathilda Riling, Sr., husband, William P Holloman, Sr., her daughter Paula Marie Holloman and her son William P Holloman Jr; siblings ,Margaret Pendarvis (David), Gertrude Cleaton (James), and George Riling, Jr. (Bea),, and son in law, John Trouth. She leaves to cherish her memory her loving children, Deanie Holloman Klepzig and husband Charles of Lake Charles and Julia Holloman Trouth of Carlyss; brother, Frank Riling; grandchildren: Paul Tassin (Anne), Melisse Leger (David), Melinda Thibodeaux (Craig), Daniel Wolf, Nicholas W. Lewing, Zachary P. Lewing, William Holloman, III (Michelle), Christopher Holloman, David Champion ( Penny), Michael Champion (Tiffany) and twenty great grandchildren and one great great grandchild. A special thank you to Brighton Bridge especially Melinda Keller and Geneva Wilson; her caregivers, Doris Celestine, Retta Broussard, Betty Theriot, Karen Fuselier, and Rhonda Sullivan, Extraordinary Minister of Holy Communion, Sally Lawrence, and the Lowry’s who drove Mrs. Holloman to Perpetual Adoration for a number of years. In lieu of flowers the family has requested that donations be made to a local church mission or a charity of their choice in Mrs. Holloman’s memory. The family will receive friends on Tuesday, April 2, 2019 in the chapel of Lakeside Funeral Home from 10:00 AM until time of service. A rosary will be prayed at 11 AM. Mass of Christian Burial will take place at Our Lady Queen of Heaven on Tuesday, April 2, 2019 1:00 PM. Monsignor Danny Torres is to officiate. Burial will follow at Consolata Cemetery. Provide comfort for the family of Naomi Mathilda Holloman (Riling) by sending flowers. My family and I are so sorry for your loss. We want to extend our sincerest condolences to you and your family. We will keep you and your family in our daily thoughts and prayers. May GOD bless ALL. Deanie, you and I had very special relationships with our Moms. Lucky us. Your Mother was a very classy lady and was very attractive. God Blessed her with a long life. Not many people live until they are 100 years old. God Bless her Soul!